It is no coincidence that the first efforts to build railroads in Mississippi began in the early 1830s, shortly after the signing of treaties that made Choctaw and Chickasaw land available for settlement and investment by US citizens, because nineteenth-century railroad building was closely connected to efforts to profit from Mississippi land. Railroads have played important roles in the state’s economy, politics, race relations, migration, music, and literature. Railroads came to the state as part of the timber industry, and that industry dominated the course of their construction for decades. Many supporters were Whigs who saw connection to a national economy as part of civic improvement. Most antebellum railroads were short tracks that allowed travel from timber areas to waterways, which remained the primary means of moving timber to urban markets until the late 1800s. In 1850 the state had just seventy-five miles of track. Some of the state’s first substantial railroads were the Mobile and Ohio and the New Orleans, Jackson, and Great Northern, which also became the first line running north–south through much of the state when it connected New Orleans to Canton in 1858. 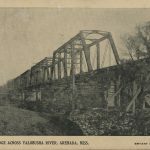 Both of those lines began in the 1850s in the southern part of the state, connecting timber areas in Clarke, Pike, and Copiah Counties to the Gulf Coast. The Mississippi Central Railroad began in 1853 in Holly Springs, and its north–south line, completed in 1860, connected to the New Orleans, Jackson, and Great Northern to allow travel through the state. The state had 872 miles of railroads on the eve of the Civil War. Although new, the state’s railroads played a major role in Civil War strategy. Significant railroad towns included Corinth (the Mobile and Ohio and the Memphis and Charleston), Meridian (the Mobile and Ohio and the Southern), and Jackson (the Southern and the New Orleans, Jackson, and Great Northern), all of which experienced significant property damage. 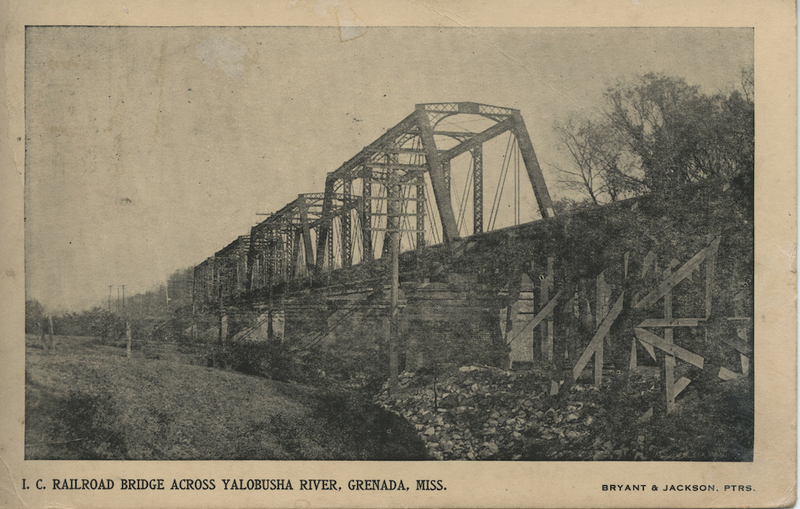 William Sherman’s forces destroyed twenty-one miles of track around Meridian, and much of the Mississippi Central line as well as railroad bridges, stations, and cars were destroyed or damaged. 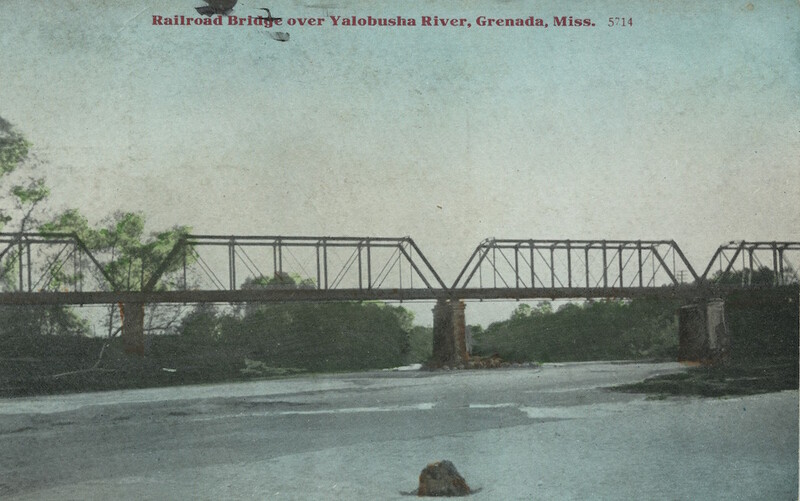 Railroad construction and timber became Mississippi’s primary industries in the 1870s and 1880s. Whereas only about 120 new miles of track were constructed from 1865 to 1880, track mileage more than doubled from 1880 (1,127 miles) to 1900 (2,788 miles), and by 1910 the state had 4,223 miles of railroads. Many of the lines continued to serve the timber industry, and according to historian James Fickle, Gulf and Ship Island Railroad’s “seventy-four-mile section from Hattiesburg to Gulfport averaged one sawmill and one turpentine distillery every three miles” in 1902. About six hundred small, impermanent “dummy lines” were constructed, allowing steam-powered trains to move people and equipment into timber areas and to transport timber out to national markets. Founded in 1851, the Illinois Central became a major force in Mississippi in the 1870s. It invested in lines owned by Henry McComb, a Delaware businessman who had taken over the Mississippi Central and then the New Orleans, Jackson, and Great Northern. McComb, the founder of the South Mississippi town that took his name, needed considerable funds to improve existing lines and build new ones, especially after merging his two lines to form the New Orleans, St. Louis, and Chicago Railroad. When it turned out that McComb did not have enough money to run his railroads, the lines went into receivership, and the Illinois Central bought them at auction in 1877, creating a network that stretched from New Orleans to Chicago and earning the company its nickname, the Main Line of Mid-America. The Louisville, New Orleans, and Texas Railroad put together several local lines in the Mississippi Delta and by the 1880s had become central to cotton growing. The Illinois Central’s 1892 purchase of the Louisville, New Orleans, and Texas made it by far the state’s most powerful company. In 1925 the Illinois Central also acquired the Gulf and Ship Island Railroad. Along the Gulf Coast, the growing rail lines facilitated the increasingly important activities of the seafood industry and tourism. The New Orleans, Mobile, and Chattanooga allowed tourists easy access to beaches, hotels, and restaurants, while fishing interests used the railroads to find new ways to market their products. In 1884 the Mississippi legislature established the state railroad commission, and its biennial report quickly became the state’s largest, with detailed information about rates, laws, controversies and lawsuits, mileage, new tracks, and accidents. In the 1880s and 1890s, Populists objected to railroad companies’ power in the state’s economy and government. As supporters of the interests of smaller farmers, Frank Burkitt and other Populist leaders advocated government regulation or even ownership of the railroads. Railroad work and railroad travel constituted an important part of the opportunities and especially the limitations of life for various Mississippians. 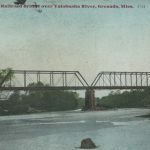 European immigrants—first from Ireland and later from Germany, Finland, and other countries—often took jobs as railroad workers, leading to the development of immigrant communities in McComb, Gluckstadt, and Water Valley. However, railroad travel also developed at the same time as racial segregation, and the state’s railroad cars became especially important sites where whites made racial distinctions. In 1888 the Mississippi legislature mandated that railroads “shall provide equal but separate accommodations for the white and colored races, by providing two or more passenger cars for each passenger train.” The Mississippi Supreme Court upheld the law in an 1889 decision. Mississippi-born reformer Ida B. Wells began her career as an activist by challenging laws that denied her access to the white ladies’ car. In the early 1900s the Illinois Central became the primary way that African Americans left Mississippi for Chicago and other northern cities. Countless blues songs mentioned trains either as reference points—Charley Patton sang of “goin’ where the Southern cross the Dog” (the junction of the Yazoo and the Mississippi Valley railroad lines)—or as a way to leave trouble and hope for a better future. For Richard Wright, travel brought both excitement about the potential of starting a new life and nervousness. He recalled that as soon as he got off the train in Chicago, he was “seized by doubt” about his decision to migrate. A wide range of Mississippians have been involved with the railroads. Postbellum town founder William Harris Hardy and writer William C. Falkner were railroad founders; Mississippi Supreme Court justice Alexander Clayton and Gov. Charles Lynch served as railroad directors or presidents; and McComb civil rights activist C. C. Bryant was a railroad man. Engineer John Luther “Casey” Jones became legendary in 1900 when he gave his life outside of Vaughan, Mississippi, to save the passengers on his train. And Meridian’s Jimmie Rodgers, known as the Singing Brakeman, was the state’s first country music star, recording numerous songs about the life of a ramblin’ man on a train, far from home. The significance of railroads has declined since the 1920s because of economic changes and the rise of competing forms of transportation. Total mileage has declined from 4,005 in 1940 to 3,691 in 1960 to less than 2,500 in 2010. Today two Amtrak trains run through Mississippi: the City of New Orleans runs from New Orleans to Chicago, with stops in McComb, Brookhaven, Hazlehurst, Jackson, Yazoo City, and Greenwood, while the Crescent connects New Orleans with New York, stopping along the way in Picayune, Hattiesburg, Laurel, and Meridian.